How Often Do You Need To Service? Established in 1990 Palmeira Bodyworks and Servicing is a small family run business based in Brighton & Sussex. Over the past 20 years we have built up a solid reputation with our repeat service business for quality work and a reliable service our rates are very reasonable. We specialise in all all makes of vehicles. We provide a high quality, professional service and we always put our customers needs and wants first. 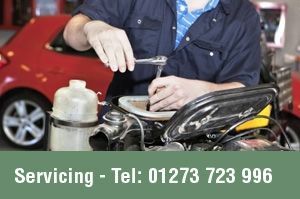 Palmeira can help with all of your Car Servicing and Bodyworks so look no further. We welcome customers old and new, trade or fleet, business users or private vehicle owners. We take a great pride in the quality and efficiency of our service - and we are always keen to keep our prices affordable. Through our hard work, we have developed a strong customer base for our car repair services extending to Patcham, Falmer, Bevendean, Portslade, Shoreham, Lancing, and throughout Brighton. From a small scratch to a large insurance claim we are a “Non Fault Accident” claims specialist and will give you free advice throughout your insurance claim. Need a garage in Hove? Looking for a bodywork specialist you can trust to carry out thorough and speedy repairs? 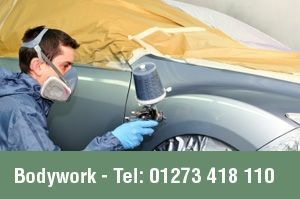 Contact Palmeira Bodyworks on 01273 418110 Servicing on 01273 723996 today for a competitive quotation.